When it comes to preparing for your future, estate planning provides a comprehensive approach that works to make the most of your assets while reserving enough capital to support your loved ones once you pass on. Nobody likes to think about their own mortality, but planning for this eventuality can provide a wide range of advantages for you and the succession of your estate. Peek Goldstone, LLC is here to provide comprehensive support for Coloradans in need. 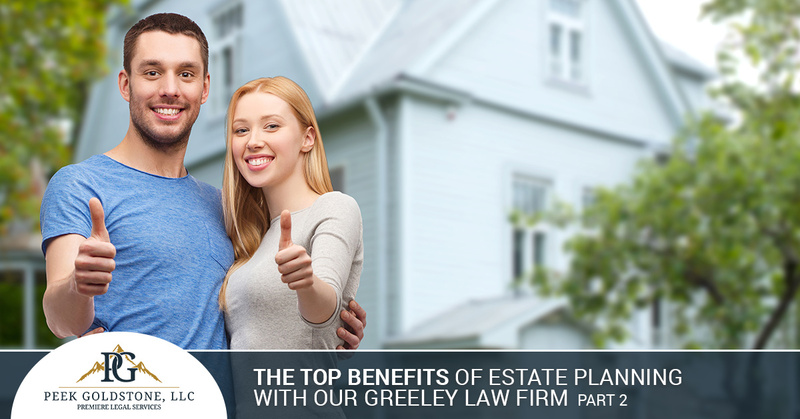 Our law firm in Greeley employs knowledgeable estate planning attorneys that can help you to create a customized plan for your goals and final wishes. Our personable approach and dedication to quality ensures that you have all of the tools needed to create long-term security for your estate. Proper planning can provide a wide range of advantages for you and your loved ones. Today, we’ll continue to highlight the top benefits of estate planning with our Colorado law firm. If you’re looking for assistance, be sure to reach out to our friendly team for quality help. Estate planning can be useful for many strategies, with one commonly used one being to keep your listed beneficiaries safe and secure. Your plan will change based on the age of these recipients, as estate law looks at instructions for minors much more carefully than adults. Minors must, by law, be appointed a guardian or conservator to care for the child until he or she is an adult. A conservator will oversee the finances of the estate until the beneficiary reaches 21. Adults will not require guardianship, but plans can be put in place to regulate their spending and ensure a positive outcome. Young adults who suddenly inherit a large sum are at risk for a wide range of dangers. Family disputes can often result from disagreements on guardianship for minor children as well as the control put in place for adult inheritors. Our law firm is here to work with you to achieve a harmonious balance for your loved ones while planning for your long-term goals. Losing a loved one can be stressful enough, but having to deal with their affairs if no effective estate plan is in place can make things much worse. It’s essential for you to take the precautions for your loved ones’ sakes. Estate plans are vital for preparing for numerous scenarios, minimizing the costs and confusion associated with settling your affairs. Estate law is very complex, resulting in high costs for both your finite time and money. It can prove wholly beneficial to speak with a local estate lawyer to learn more about how to protect your loved ones through this difficult process. Estate planning also involves advance healthcare directives, which deliver your wishes should you be physically and/or mentally incapacitated. This scenario can be a nightmare for families who are unsure as to their loved one’s wishes. The biggest reason why most Coloradans seek the help of our estate planning attorneys is because they want to avoid probate. When an individual dies, their will and estate will need to be verified by an official body. Probate court will oversee the handling of your affairs, often designing an administrator for your responsibilities to take care of all your unfinished business. This validation process works to ensure that everything is done within accordance of the law and that the testator made their decisions with a clear mind. Individuals who wish to challenge the validity of a will can do so if they are allowed to do so and have valid complaints. The probate process can take months to complete, tying up your assets and possibly costing a lot of money in the process. It is highly recommended to start your estate plan now to minimize your chances of dealing with probate. At the least, planning for every outcome can provide peace of mind and protection during your lifetime and beyond. Simple steps now can result in major benefits later on! If you’re unsure as to the status of your assets or succession plan, the estate planning attorneys here at Peek Goldstone, LLC are ready to help. Our team of local lawyers can help Coloradans achieve security and control over their futures, delivering comprehensive assistance that is tailored to your personal needs. Our law firm in Greeley also provides assistance in family law, traffic violations, and more. Contact us today to learn more about our estate planning services!